Thought I would end this week with a few favorites from last week’s trip to Washington, DC. I will add shooting tips to the challenges I faced in hopes of helping other traveling photographers. I will start with the reason for our trip to Washington, DC which was to visit with my daughter, Krystal, who was completing a business trip for the Theodore Roosevelt Center and was able to spend some time with us. 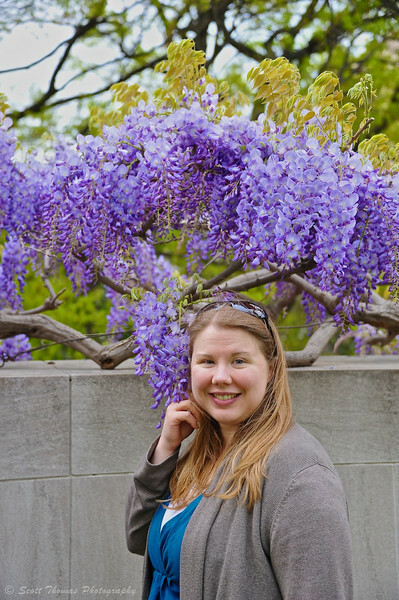 Krystal in front of a flowering Japanese wisteria tree on the National Mall in Washington, DC. Nikon D700/28-300VR, 1/125s, f/4.8, ISO 720, EV +0.3, 62mm focal length. Not much photographically challenging here but I could not find out what kind of tree Krystal was in front of. They were all over Washington. I thought I saw the same tree on Nye’s recent post about the Biltmore Estate. A quick email exchange confirmed the trees to be the Japanese Wisteria. Thanks, Nye! 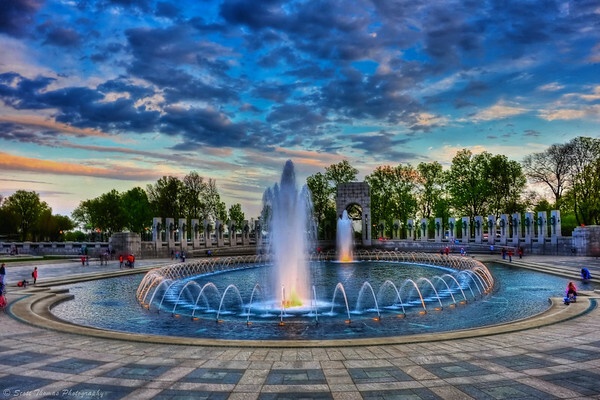 World War II National Memorial in Washington, DC. Nikon D700/28-300VR, f/16, ISO 200, EV 0, 28mm focal length, tripod, HDR Image. The day we visited the Smithsonian National Zoological Park, I took many photos of the animals on exhibit. 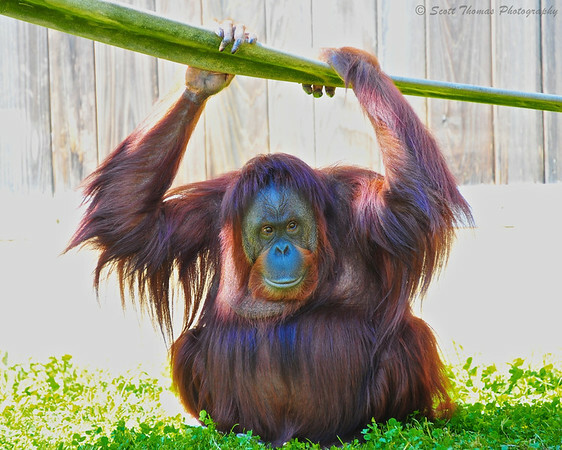 None more interesting than this Orangutan who was calmly enjoying the warm Spring day as everyone was watching him. Orangutan hanging out at the National Zoo in Washington, DC. Nikon D700/28-300VR, 1/125s, f/5.6, ISO 560, EV -0.3, 250mm focal length, spot metering. There is a lot going on here. He was in shade with bright sunshine behind him which required me to switch to spot metering to get a correct exposure on his face. That in turn blew out much of the background. In a studio this is called a High Key portrait. Even with all its flaws, it is still one of my favorites from the trip. Maybe some heavy duty photo manipulation could save this. We took a tour of the U. S. Capitol building and the new Capitol Visitor Center is an outstanding historical museum. It details how the building was built over the centuries and the men and women who helped to mold the United States inside it in displays, informational signs, photographs and interactive computer stations. Even if you do not take the tour, I would recommend stopping here for the exhibits. It’s free! Apotheosis of Washington in the eye of the Rotunda of the U.S. Capitol was painted in the true fresco technique by Constantino Brumidi in 1865. Nikon D700/Tokina 11-16mm, 1/60s, f/6.3, ISO 200, EV +0.3, 15mm focal length. 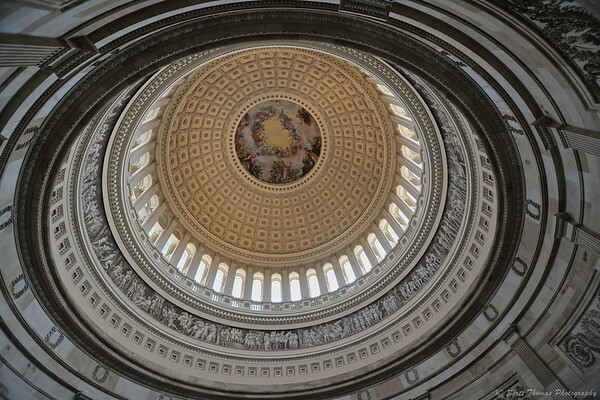 The big challenge here was to photograph the inside of the huge dome in the U. S. Capitol’s rotunda. I put on the Tokina 11-16mm f/2.8 lens which I can use on my full frame Nikon D700 dSLR camera as wide as 15mm. I could not stand in the exact center as that is reserved for Congressmen to walk through. I liked how this off center composition came out anyway. The last building we visited was the Library of Congress. I did not do any research beforehand as it was not on our initial list of places to see. 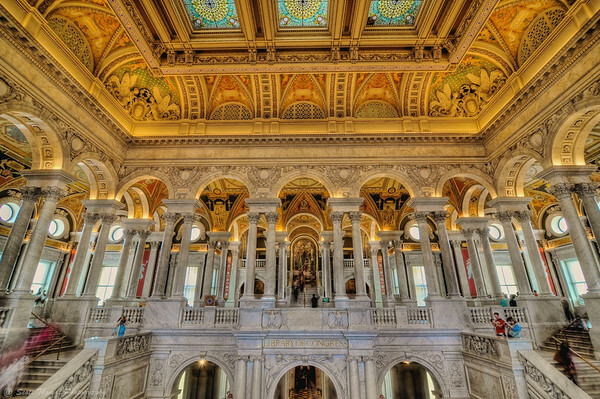 I was pleasantly blown away by the beauty of the Great Hall in the Thomas Jefferson building of the Library. The Great Hall inside the Thomas Jefferson Building of the Library of Congress in Washington, DC. Nikon D700/Tokina 11-16mm, f/8, ISO 200, EV +0.3, 16mm focal length, bean bag, HDR Image. To capture the grandeur of the Great Hall, I again used the Tokina wide angle lens and took a set of 7 bracketed photos to cover the range of light. No tripods or monopods are allowed in the Library of Congress so I used a bean bag on a marble pedestal to steady the camera as it took photos with shutter speeds ranging from 1/25th of a second to 2.5 seconds. This entry was posted in Photography, Travel and tagged "washington, 28-300mm, aperture 3, building, capitol, daughter, dc", dome, flowering, fountain, great hall, hdr, high key, japanese wisteria, library of congress, mammal, memorial, national mall, national zoo, nikon D700, orangutan, photomatix, primate, purple, rotunda, smithsonian, thomas jeffereson, tokina 11-16mm, tree, united states, us, vr, water, woman, world war 2. Bookmark the permalink. Visiting with Krystal is one of the best reasons I can think of for going to Washington. That’s a beautiful portrait. The library shot is glorious too – perfectly framed. Beanbag. Must remember that. It was, Gerry. We had some time to ourselves to explore, too. She’s a Washignton, DC expert having lived there for a few months when she interned with the Smithsonian. The Library of Congress building both inside and outside has sculptures and art work which all tell the story of the knowledge kept there. We had a very knowledgable tour guide who talked about the meanings of a lot of it. Oh, and if you like marble, this is the place to go. Everything you see in that picture is made of marble. You are correct and I will be changing the text accordingly. You are welcome Scott, like I’ve said earlier, beautiful model and flowers. 🙂 And thanks for the tour, I’ve been enjoying seeing all the photos. DC looks a lot prettier through your lens. I did my best not to show how very crowded it was around the monuments and museums. There were many school groups visiting at the time. Buses everywhere! Thanks, KD. However, it wasn’t the photo but how I was representing it that was wrong. I still might have something up my sleeve in the future to present it better. As I stated, it is still one of my favorites. He did a whole series of faces which I might do something with someday. Beanbags? Wow, what a cool idea. The wisteria makes a lovely frame for your daughter. I would’ve been equally fascinated with the orangutan. DC is definitely on my bucket list! Thanks for sharing your visit this week. If you go to DC, I would recommend NOT going during school Spring breaks. Last time I went it was late July and not nearly as crowded but the weather was very hot and humid. The bean bag I use was designed for cameras which is not available any longer. There are lots of websites which will show you how to make your own if you are interested. Very handy in a pinch.